Marketing-Works! : Do S-curves really exist in marketing? The s-curve represent a non-linear (bendy) relationship between an input (labour, advertising, time) and an output (productivity, sales, population). S-curves apparently occur quite often in nature - i believe that population projections are based on an S-curve relationships. They are also popular for those considering product life-cycle projections - the classic diffusion model popular in social science makes use of s-curve type relationships. 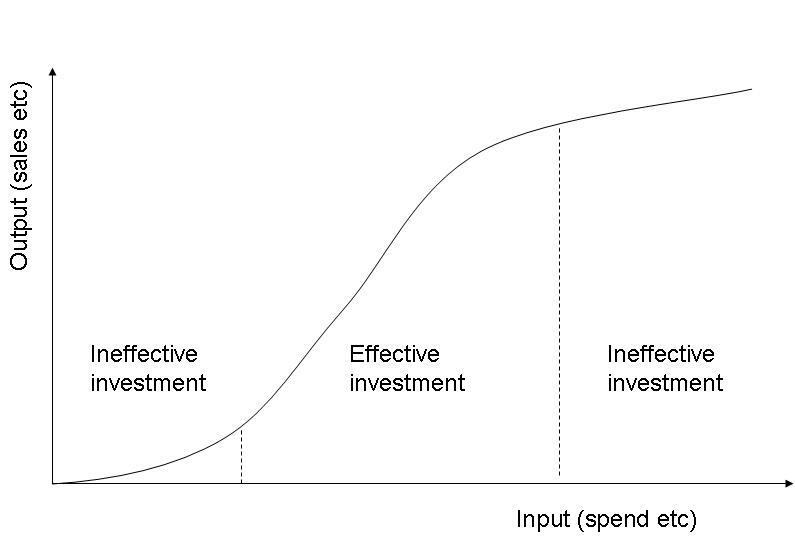 From the marketing point-of-view, we typically use an S-curve to represent a situation where we expect that a small amount of input will make little difference whilst the marginal benefit from a large to very large input will also have little effect. In between these points is what is known as the effective range where returns are at their greatest. Marketeers often talk about s-curves when debating how marketing works. A popular opinion is that there is a minimum level of advertising below which investment will be ineffective. Others counter that there is no logical reason why the second exposure to a message (if identical) will be more effective than the first exposure. As such they prefer the alternative diminishing returns curve. For marketing channels other than advertising, the debate also exists. In the study of sales forces, it is far harder to argue that an s-curve relationship exists between the number of salesmen and overall sales. The argument goes that the salesmen an organisation adds to an already large pile are likely to deliver only marginal incremental benefit to an organisation whilst the first salesman should offer the greatest ROI. Seth Godin has recently written about this on his blog and he offers an alternative view which supports the s-curve for sales forces. S-curves represent a real challenge for market researchers. In terms of estimation, one requires far more data to estimate a relationship of this type and it's difficult to determine what functional form to use for estimation. I've experimented in the past with trying to estimate S-curves using the Gompertz relationship. The fact that there are an extra two parameters to estimate in a regression means that margins of error become very wide very quickly. I've yet to see conclusive proof that S-curves exist in marketing. On occasions, I've seen evidence which points to their existence but it's far from case proven in my eyes. From the point-of-view of researchers, my opinion is that unless it's essential to find an S-relationship in your data, I suggest you steer clear of this type of estimation and stick to looking for the point of diminishing returns. One other point to make today - the importance of trying to measure diminishing returns is often overlooked but the power of diminishing returns is massive. In this piece, Victor Cook has outlined some basic but powerful analysis which highlights why this concept matters so much to businesses looking for answers - not just reports. The graphics of the area under a bell curve is an s-curve. So if you think bell curve behavior exists (and I can't think of anything in the world that doesn't follow one) then as something becomes more accepted the desire will reduce - an s curve. Related is the Dunning-Kruger effect.